Hidden surprises within a brand are some of our favorite elements. It’s fun to develop the style of a brand with the logo, color palette and fonts. When we are finished, we have literally created an owners manual for each client’s brand. These manuals are full of instructions and details like: Nuetra Text SC Book font in size 16 for headlines. PMS color 170 for that specific shade of coral used in the background. All photos are square except for one rounded corner. One inch of white space around the logo. The guidelines can be endless, but put all of these details together and they help us consistently handle every aspect of a brand. This is how brands become recognizable. People look for these familiar elements that tell them it’s a specific product or company, often without realizing they are doing it. How many times have you scanned the grocery store shelves looking for a specific element – The bright orange box with blue lettering for your laundry detergent? Or the red and white can for your favorite cola? There are many clever ways to add breadth to a brand, but one thing we always pursue for our clients are the unexpected details that will get them noticed, and help set them apart. Our favorite unexpected element we use when expanding or creating a brand are patterns. Many times we create the pattern as more of a secondary element that later becomes an essential part of the company’s style. We tuck these patterns on the back of letterhead so when it’s folded it creates this unexpected splash of color inside the envelope. KRS – Letterhead: We applied the pattern to the back of the letterhead to grab the recipients attention and build excitement as they open the letter. We’ve also included them as an extra pop on the back of business cards as well as on the inside of folders and brochure covers. 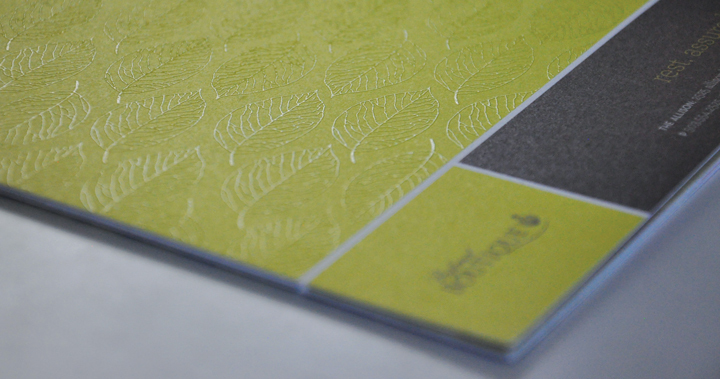 The Allison – Brochure: This leaf pattern was added to the brochure cover using a clear thermography – a fun effect that also adds a textural element. IPM – Business Cards: We applied the box pattern on the back of the business cards to give IPM a fresh approach to their brand with an updated look. The patterns become delightful points of interest where you would typically see nothing at all. Being in “the biz” we often find ourselves turning over pieces, looking for fun hidden elements that others may have included. When it comes to developing these patterns there is actually more thought behind them than what might first meet the eye. The patterns we create are often derived from elements in the client’s logo or shapes that help tell the story about the client or their products or services. Below are a few other samples of fun pattern elements we’ve created to enhance our clients’ overall brands. Text No More – Pocket Style Folder: Text No More has a young audience so we created a background pattern out of typical text messages, which we applied here on their folder. The Allison – Gift Card Box: Sometimes a simple elegance can be achieved with a pattern. KRS – Brochure: The UV coating technique on the back of this brochure made their orange pattern shine.